365doctor.in offers a peerless platform to each and every person with the details of numerous doctors with their location as well as their specialties, making it easy for the needy to search for a perfect doctor according to the requirement. Launched in 2016, 365doctor.in is infatuated by inspirational minds of Romil Tripathi and Bharat Bheem Singh. As they don’t want anyone to face problems related to the diseases, they have come up with the website which provides an option of Blog where a person can get the information related to each and every kind of diseases such as causes, symptoms and treatments, etc. The platform also allows people to inform others about any kind of disease gripping the society. They just have to make an account by registering themselves and they can fill in the details about a particular disease. The website also offers an option to the public to book their appointment, consult online with the doctor after finding the preferred one on the basis of their specialty or location. The main aim of 365doctor.in is to take the public out of the confusions of making a guess that which disease they are suffering from. The team wants to provide each person with the details of the diseases and also to make them aware about the symptoms and precautions for the various diseases. Our main motto is to provide the information to the needy who cannot afford or are unable to consult a doctor due to the shortage of time or unavailability of the doctor. Our team consists of young and out of the box thinkers, which can turn the world upside down from their unique ideas and take the organization to different heights. This ensures the growth rate of the company to enhance each and every day. To join hands in the process of taking the organization to another level, the team works day and night and leaves no stone unturned during the working time. Due to the combined efforts of each and every team member only, we are able to touch these heights and will also create history in the world. The rubaroo'16 is the National Level Cultural Fest of the SRM UNIVERSITY DELHI NCR CAMPUS, which allows students to showcase their talents of singing, dancing, music, etc. The fest was introduced long back and is conducted each and every year and every year it’s getting bigger and better. 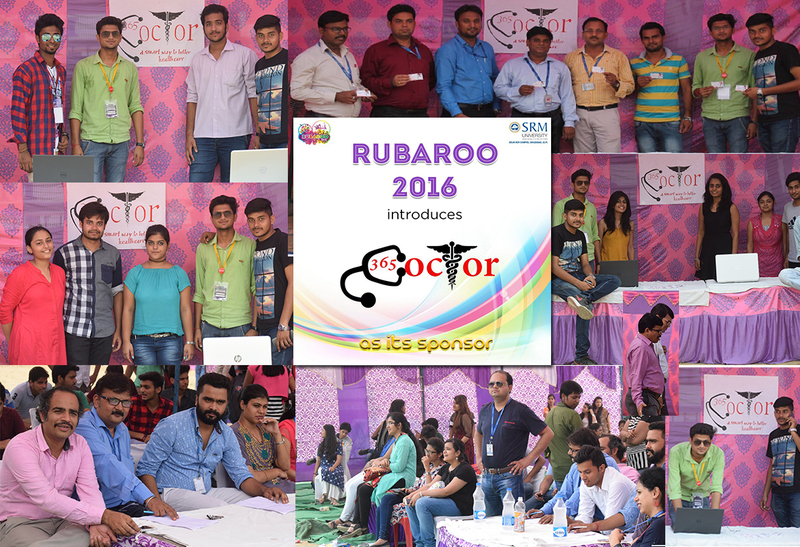 This time 365doctor was sponsoring the whole fest and the role of the company was to take care of the healthcare related problems faced by the contestants during the whole fest. The fest conducts various competitions in the daytime such as Der Reiz, Battle of bands, Treasure hunt, Fashion show, etc. During Night various events were conducted all the three days such as Campus Princess, Musical Night By PALASH SEN, DJ Night with DJ RAY and DJ MojoJojo. The whole fest was a blast and the participants were curious to know more about the organization and the team was present there to clear the doubts of the people. We are self funded organisation and are not reliable on any other being. The heights reached by us till now is totally the outcome of the pillars founded by us at the time of founding our organisation which helped us to overcome the different problems faced by us, at various positions. We are looking forward to collaborate with some great people in future.